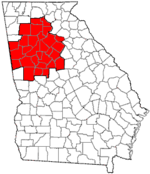 Cobb County is a suburban county in the U.S. state of Georgia. As of 2017, the population was 755,754, making it Georgia's third most-populous county. Its county seat and largest city is Marietta. Along with several adjoining counties, Cobb County was founded on December 3, 1832, by the Georgia General Assembly from the large Cherokee County territory—land northwest of the Chattahoochee River which the state confiscated from the Cherokee Nation and redistributed to settlers via lottery, following the passage of the federal Indian Removal Act. The county was named for Thomas Willis Cobb, a U.S. representative and senator from Georgia. It is believed that Marietta was named for his wife, Mary. Cobb County is included in the Atlanta-Sandy Springs-Roswell, GA Metropolitan Statistical Area. It is situated immediately to the northwest of Atlanta's city limits. Its Cumberland District, an edge city, has over 24,000,000 square feet (2,200,000 m2) of office space. As of 2017, Major League Baseball's Atlanta Braves play in Cumberland. The U.S. Census Bureau ranks Cobb County as the most-educated in the state of Georgia and 12th among all counties in the US. It has ranked among the Top 100 wealthiest counties in the nation. In October 2017, Cobb was ranked as the "Least Obese County in Georgia"
Cobb county was one of nine Georgia counties carved out of the disputed territory of the Cherokee Nation in 1832. It was the 81st county in Georgia and named for Judge Thomas Willis Cobb, who served as a U.S. Senator, state representative, and superior court judge. It is believed that the county seat of Marietta was named for Judge Cobb's wife, Mary. The state started acquiring right-of-way for the Western & Atlantic Railroad in 1836. A train began running between Marietta and Marthasville (now Atlanta) in 1845. Before the Civil War, Marietta was also a summer resort for residents of Savannah and Charleston fleeing yellow fever. During the American Civil War, some confederate troops were trained at a camp in Big Shanty (now Kennesaw), where the Andrews Raid occurred, starting the Great Locomotive Chase. There were battles of New Hope Church May 25, Pickett's Mill May 27, and Dallas May 28. These were followed by the prolonged series of battles through most of June until very early July: the Battle of Marietta and the Battle of Noonday Creek. The Battle of Allatoona Pass on October 28 occurred as Sherman was starting his march through Georgia. Union forces burnt most houses and confiscated or burnt crops. The Battle of Kennesaw Mountain June 27, 1864, was the site of the only major Confederate victory in General William T. Sherman's invasion of Georgia. Despite the victory, Union forces outflanked the Confederates. In 1915, Leo Frank, the Jewish supervisor of an Atlanta pencil factory who was convicted of murdering one of his workers, thirteen-year-old Mary Phagan, was kidnapped from his jail cell and brought to Frey's Gin, two miles (3 km) east of Marietta, where he was lynched. Cotton farming in the area peaked from the 1890s through the 1920s. Low prices during the Great Depression resulted in the cessation of cotton farming throughout Cobb County. The price of cotton went from 16¢ per pound (35¢/kg) in 1920 to 9½¢ (21¢/kg) in 1930. This resulted in a cotton bust for the county, which had stopped growing the product but was milling it. This bust was in turn, followed by the Great Depression. To help combat the bust, the state started work on a road in 1922 that would later become U.S. 41, later replaced by Cobb Parkway in the late 1940s and early 1950s. In 1942, Bell Aircraft opened a Marietta plant to manufacture B-29 bombers and Marietta Army Airfield was founded. Both were closed after World War II, but reopened during the Korean War, when the air field was acquired by the Air Force, renamed Dobbins AFB, and the plant by Lockheed. During the Korean and Vietnam Wars, Lockheed Marietta was the leading manufacturer of military transport planes, including the C-130 Hercules and the C-5 Galaxy. "In Cobb County and other sprawling Cold War suburbs from Orange County to Norfolk/Hampton Roads, the direct link between federal defense spending and local economic prosperity structured a bipartisan political culture of hawkish conservatism and material self-interest on issues of national security." When county home rule was enacted statewide by amendment to the Georgia state constitution in the early 1960s, Ernest W. Barrett became the first chairman of the new county commission. The county courthouse, built in 1888, was demolished, spurring a law that now prevents counties from doing so without a referendum. In the 1960s and 1970s, Cobb transformed from rural to suburban, as integration spurred white flight from the city of Atlanta, which by 1970 was majority-African-American. Real-estate booms drew rural white southerners and Rust Belt transplants, both groups mostly first-generation white-collar workers. Cobb County was the home of former segregationist and Georgia governor Lester Maddox (1966–71). In 1975, Cobb voters elected John Birch Society leader Larry McDonald to Congress, running in opposition to desegregation busing. A conservative Democrat, McDonald called for investigations into alleged plots by the Rockefellers and the Soviet Union to impose "socialist-one-world-government" and co-founded the Western Goals Foundation. In 1983, McDonald died aboard Korean Air Lines Flight 007, shot down by a Soviet fighter jet over restricted airspace. I-75 through the county is now named for him. In 1990, Republican Congressmen Newt Gingrich became Representative of a new district centered around Cobb County. In 1994, as Republicans took control of the U.S. House of Representatives for the first time in almost fifty years, Gingrich became Speaker of the House, thrusting Cobb County into the national spotlight. In 1993, county commissioners passed a resolution condemning homosexuality and cut off funding for the arts after complaints about a community theater. After protests from gay rights organizations, organizers of the 1996 Summer Olympics pulled events out of Cobb County, including the Olympic Torch Relay. The county's inns were nevertheless filled at 100% of capacity for two months during the event. In the 1990s and 2000s, Cobb's demographics changed. As Atlanta's gentrification reversed decades of white flight, middle-class African-Americans and Russian, Bosnian, Chinese, Indian, Brazilian, Mexican and Central American immigrants moved to older suburbs in south and southwest Cobb. In 2010, African-American Democrat David Scott was elected to Georgia's 13th congressional district, which included many of those suburbs. Cobb became the first Georgia county to participate in the Immigration and Nationality Act Section 287(g) enabling local law officers to enforce immigration law. According to the U.S. Census Bureau, the county has a total area of 345 square miles (890 km2), of which 340 square miles (880 km2) is land and 4.0 square miles (10 km2) (1.4%) is water. The county is divided between two major basins. Most runoff flows into the Middle Chattahoochee-Lake Harding and Upper Chattahoochee River sub-basins of the ACF River Basin (Apalachicola-Chattahoochee-Flint River Basin) along the southeastern border, directly via Willeo Creek, Sope Creek (Sewell Creek), Rottenwood Creek (Powers Creek, Poorhouse Creek, Poplar Creek), Nickajack Creek and others. The large Sweetwater Creek is the other major stream, carrying the waters of Noses Creek (Ward Creek, Olley Creek, Mud Creek), Powder Springs Creek (Rakestraw Creek, Mill Creek) and others into the Chattahoochee. A ridge from Lost Mountain in the west, to Kennesaw Mountain in the north-central, to Sweat Mountain in the extreme northeast, divides the far north-northwest of the county into the Etowah River sub-basin of the ACT River Basin (Coosa-Tallapoosa River Basin), which includes Lake Allatoona. Noonday Creek (Little Noonday Creek) flows northward into the lake, as does Allatoona Creek, which forms a major arm of the lake. Proctor Creek forms the much older Lake Acworth, which in turn empties directly into Lake Allatoona under the Lake Acworth Drive (Georgia 92) bridge. North Cobb is in the Coosa River basin. There are several high points in Cobb County. Despite the lack of a grid system of city blocks though the county, all street addresses have their numeric origin at the southwest corner of the town square in Marietta. Originally in area code 404, the county was moved into area code 770 in 1995, and overlaid by area code 678 in 1998. Prior to 1995, those with phones tied to the Woodstock telephone exchange (prefixes 924, 926, 928, later 516 and 591) could also call the Canton exchange (479, later 445, then 704) as a local call. This became moot, along with other dual-zone exchanges in metro Atlanta, when the exurban exchanges (including Canton) were fully made a part of what was already the world's largest toll-free calling zone. It is a zone spanning 7,162 square miles (18,549 km2), with four active telephone area codes, and local calling extending into portions of two others. Cobb's FIPS county code is 13067. Because the National Weather Service has not subdivided the county, its WRSAME code is 013067, for receiving targeted weather warnings from NOAA Weather Radio. The county is primarily within the broadcast range of one weather radio station: KEC80, on 162.550 MHz, transmitted to all of metro Atlanta and broadcast from NWSFO Peachtree City. The secondary station is the much newer WWH23 on 162.425 from Buchanan, which also transmits warnings for Cobb but has reception mainly in the western part of the county. As of 2000, there were 697,553 people, 248,303 households, and 169,178 families residing in the county. The population density was 1,998 people per square mile (763/km²). There were 261,659 housing units at an average density of 770 per square mile (301/km²). The racial makeup of the county in 2010 72.4% White, 18.8% Black, 0.3% Native American, 3.06% Asian, 0.0% Pacific Islander, 5.3% from other races, and 1.87% from two or more races. 7.73% of the population was Hispanic or Latino of any race. There were 248,303 households out of which 35.80% had children under the age of 18 living with them, 54.30% were married couples living together, 10.70% had a female householder with no husband present, and 31.20% were non-families. 23.20% of all households were made up of individuals and 4.10% had someone living alone who was 65 years of age or older. The average household size was 2.71 and the average family size was 3.25. In the county, the population was spread out with 26.10% under the age of 18, 9.00% from 18 to 24, 36.50% from 25 to 44, 21.50% from 45 to 64, and 6.90% who were 65 years of age or older. The median age was 33 years. For every 100 females, there were 98.50 males. For every 100 females age 18 and over, there were 95.90 males. As of 2007, the median income was $70,472. The per capita income for the county was $32,740. About 6.0% of families and 9.4% of the population were below the poverty line, including 9.1% of those under age 18 and 7.8% of those age 65 or over. As of the 2010 United States Census, there were 688,078 people, 260,056 households, and 175,357 families residing in the county. The population density was 2,026.4 inhabitants per square mile (782.4/km2). There were 286,490 housing units at an average density of 843.7 per square mile (325.8/km2). The racial makeup of the county was 62.21% white, 24.96% black or African American, 4.46% Asian, 0.34% American Indian, 0.1% Pacific islander, 5.28% from other races, and 2.71% from two or more races. Those of Hispanic or Latino origin made up 12.26% of the population. In terms of ancestry, 10.4% were German, 10.0% were English, 9.3% were Irish, and 8.6% were American. Of the 260,056 households, 36.7% had children under the age of 18 living with them, 50.2% were married couples living together, 13.0% had a female householder with no husband present, 32.6% were non-families, and 25.6% of all households were made up of individuals. The average household size was 2.61 and the average family size was 3.17. The median age was 35.4 years. The median income for a household in the county was $65,522 and the median income for a family was $78,920. Males had a median income of $55,200 versus $43,367 for females. The per capita income for the county was $33,110. About 7.6% of families and 10.6% of the population were below the poverty line, including 14.5% of those under age 18 and 7.2% of those age 65 or over. The Smyrna Public Library is a city-owned library in Smyrna. Under Georgia's home rule provision, county governments have free rein to legislate on all matters within the county, provided that such legislation does not conflict with state or federal laws or constitutions. Cobb County is governed by a five-member board of commissioners, which has both legislative and executive authority within the county. The chairman of the board is elected county-wide. The other four commissioners are elected from single-member districts. The board hires a county manager who oversees day-to-day operations of the county's executive departments. County residents also elect a sheriff, district attorney, probate court judge, clerk of superior court, clerk of the state court, state court solicitor, chief magistrate judge (who then appoints other magistrate court judges), superior court judges, state court judges, tax commissioner, surveyor, and a seven-member board of education. In addition to the county sheriff, the constitutional chief law enforcement officer of the county, Cobb County has a separate police department under the authority of the Board of Commissioners. The sheriff oversees the jail, to which everyone arrested under state law is taken, regardless of the city or other area of the county where it happens, or which police department makes the arrest. Each city has a separate police department, answerable to its governing council. Marietta, Smyrna, and Austell have separate fire departments, with the Cobb County Fire Department being the authority having jurisdiction over Kennesaw, Acworth, Powder Springs, and unincorporated areas. Cobb 911 covers unincorporated areas and the city of Marietta. Kennesaw and Acworth jointly operate a small 911 call center (PSAP) upstairs in Kennesaw city hall, dispatching the police departments in both cities, and forwarding fire calls to Cobb. Smyrna operates a separate PSAP while offering dispatch services to the city of Powder Springs. Austell operates its own separate 911 system. The county retails potable water to much of the county, and wholesales it to various cities. The current County Manager is Rob Hosack. From 1980 until 2012, the county was a Republican stronghold in presidential elections. In 2016, Hillary Clinton became the first Democrat to win Cobb County since 1976, when Georgia native Jimmy Carter won every county in the state. In addition to the 4% statewide sales tax, Cobb County levies an additional 2% for special projects, each 1% subject to separate renewal every few years by countywide referendum (including within its cities). This funds mainly transportation and parks. Cobb levies a 1% tax to lower property taxes, but only for the public school budget, and not the additional 1% HOST homestead exemption for general funds. The county has also voted not to pay the extra 1% to join MARTA. At the beginning of 2006, Cobb became the last county in the state to raise the tax to 6%, which also doubled the tax on food to 2%. The SPLOST barely passed by a 114 vote margin, or less than one-quarter of a percent, in a September 2005 referendum. The revenue was to go to a new county courthouse, expanded jail, various transportation projects, and the purchasing of property for parks and green space. In 2008, the school tax was renewed for a third term, funding the Marietta and Cobb school systems. The Cobb County School District is Cobb County's largest employer, employing over 15,000 people. The Consulate-General of Costa Rica in Atlanta is located in Suite 100 at 1870 The Exchange in an unincorporated section of Cobb County. Xpress GA/RTA commuter buses and CobbLinc Marietta/Cobb Counties Transit System serve the county. MARTA also has connecting bus service to the Cumberland, Georgia business district in the southeastern part of the county. Cobb County landmark and reference point "The Big Chicken"
^ a b "State & County QuickFacts". United States Census Bureau. Archived from the original on July 8, 2011. Retrieved February 15, 2014. ^ "New Georgia Encyclopedia: Marietta". Georgiaencyclopedia.org. 2003-09-30. Retrieved 2010-07-22. ^ CNN, Jill Martin,. "Braves begin new chapter at SunTrust Park". Retrieved 13 September 2017. ^ "ACS: Ranking Table -- Percent of People With a Bachelor's Degree or More". 4 October 2003. Archived from the original on 4 October 2003. Retrieved 13 September 2017. ^ "Least Obese County in Every State". msn. 2017-09-08. Retrieved 2018-03-19. ^ "Marietta | Georgia.gov". Marietta.georgia.gov. Retrieved 2012-06-24. ^ a b c d "Cobb County, Georgia, History, Resources, Links, and Events". roadsidegeorgia.com. Retrieved March 7, 2018. ^ Images of Acworth Society for Historic Preservation. Charleston, SC: Arcadia Publishing. 2006. p. 7. ISBN 0-7385-1479-9. ^ Images of Acworth Society for Historic Preservation. Charleston, SC: Arcadia Publishing. 2006. p. 56. ISBN 0-7385-1479-9. ^ Matthew Lassiter, "Big Government and Family Values: Political Culture in the Metropolitan Sunbelt", Sunbelt Rising: The Politics of Place, Space and Region (eds. Michelle Nickerson, Darren Dochuck), pg. 90. ^ Applebome, Peter (1993-08-29). "County's Anti-Gay Move Catches Few by Surprise". The New York Times. ^ "NOAA Weather Radio KEC80". Nws.noaa.gov. 2009-05-14. Retrieved 2010-07-22. ^ "NOAA Weather Radio WWH23". Nws.noaa.gov. 2009-05-14. Retrieved 2010-07-22. ^ "American FactFinder". Retrieved March 22, 2018. ^ "U.S. Decennial Census". United States Census Bureau. Archived from the original on May 12, 2015. Retrieved June 20, 2014. ^ "Historical Census Browser". University of Virginia Library. Retrieved June 20, 2014. ^ "Population of Counties by Decennial Census: 1900 to 1990". United States Census Bureau. Retrieved June 20, 2014. ^ "Census 2000 PHC-T-4. Ranking Tables for Counties: 1990 and 2000" (PDF). United States Census Bureau. Retrieved June 20, 2014. ^ "Cobb County Census Viewer". United States Census. ^ Data Access and Dissemination Systems. "American FactFinder - Results". Archived from the original on 2016-04-17. ^ "Population of Cobb County, Georgia". censusviewer. Retrieved 17 November 2018. ^ "Cumberland School". Cumberland School. Retrieved 17 November 2018. ^ School, Dominion Christian. "Dominion Christian School - Reston, Virginia". www.dominionschool.com. ^ "Midway Covenant Christian School". Midway Covenant Christian School. ^ "North Cobb Christian School - Private School Open House - North Cobb Christian School". www.ncchristian.org. ^ "GNIS Detail - The Walker School". geonames.usgs.gov. Retrieved 23 September 2017. ^ "Our Campus - Whitefield Academy". www.whitefieldacademy.com. ^ Kennesaw.com. "Kennesaw State, Southern Poly to Merge". www.kennesaw.com. Retrieved 2016-03-11. ^ "Cobb County Government". Water.cobbcountyga.gov. Archived from the original on 2012-12-31. Retrieved 2012-12-22. ^ Abernathy, Kristina. "County Manager". cobbcounty.org. Retrieved 2016-02-03. ^ Leip, David. "Dave Leip's Atlas of U.S. Presidential Elections". uselectionatlas.org. Retrieved 13 September 2017. ^ "Cobb Local Sales Tax for Public Safety and Transportation". Cobbcip.org. 2005-09-20. Archived from the original on 2010-11-07. Retrieved 2010-07-22. ^ "Index". Cobb County School District. Archived from the original on May 30, 2009. Retrieved July 28, 2009. ^ Corporate and Financial Overview Archived 2011-10-02 at the Wayback Machine. The Home Depot; retrieved April 24, 2009. ^ "Video Submission Agreement Archived October 19, 2009, at the Wayback Machine", The Weather Channel; retrieved on November 18, 2009. ^ "Low Weekly Rates! Archived 2011-07-13 at the Wayback Machine, InTown Suites; retrieved November 18, 2009. ^ "New Georgia Encyclopedia: Lockheed Martin". Georgiaencyclopedia.org. Retrieved 2012-12-26. ^ "Kool Smiles Main Contacts", Kool Smiles; retrieved January 1, 2011. "Kool Smiles Patient Support Center 1090 Northchase Pkwy SE, Ste 290 Marietta, GA 30067-6407"
^ "Consulates in the United States Archived October 22, 2008, at the Wayback Machine", Embassy of Costa Rica; retrieved October 26, 2008. ^ "Chattahoochee River National Recreation Area - Chattahoochee River National Recreation Area". Nps.gov. 2012-12-11. Retrieved 2012-12-26. ^ "Kennesaw Mountain National Battlefield Park - Kennesaw Mountain National Battlefield Park". Nps.gov. 2012-08-07. Retrieved 2012-12-26. ^ "Acworth Beach | Cauble Park, Acworth, Georgia". Allatoonalake.org. 2008-01-20. Retrieved 2012-12-26. ^ "recreation area details - Allatoona Lake". Recreation.gov. Retrieved 2012-12-26. ^ a b "Arts Center". The Mable House. Retrieved 2012-12-26. ^ "Confederate Cemetery, Marietta, Georgia". Roadsidegeorgia.com. Retrieved 2012-12-26. ^ Home. "Marietta Museum of History » Preserving the history of Marietta and Cobb County". Mariettahistory.org. Retrieved 2012-12-26. ^ "MariettaCobb Museum of Art - Marietta/Cobb Museum of Art". Mariettacobbartmuseum.org. Retrieved 2012-12-26. ^ National Cemetery Administration. "Cemeteries - Marietta National Cemetery - Burial and Memorial Benefits". Cem.va.gov. Retrieved 2012-12-26. ^ "Cobb County Parks, Recreation, Cultural Affairs". Prca.cobbcountyga.gov. Archived from the original on 2013-03-02. Retrieved 2012-12-26. ^ "The Southern Museum of Civil War and Locomotive History". Southernmuseum.org. Retrieved 2012-12-26. ^ "civic center". Prca.cobbcountyga.gov. Archived from the original on 2012-12-15. Retrieved 2012-12-26. ^ "Cobb Energy Performing Arts Centre website". Cobbenergycentre.com. Retrieved 2012-12-26. ^ "Atlanta Braves announce plans to move to new stadium". USA Today. ^ Cook, James F. (2005). The Governors of Georgia, 1754-2004, 3rd Edition, Revised and Expanded. Macon, GA: Mercer University Press. ^ "New Georgia Encyclopedia: Roy Barnes (b. 1948)". Georgiaencyclopedia.org. Retrieved August 29, 2010. ^ "James V. Carmichael (1910-1972)". New Georgia Encyclopedia. ^ "Wrestling - Big Boss Man's Theme Lyrics - MetroLyrics". ^ "Cobb County Delegation Visits South Korea". Global Atlanta Works. Atlanta Regional Commission. Archived from the original on 2009-01-06. Retrieved 2008-10-26. Atlanta Bread Company is a privately owned bakery cafe chain established in the United States in 1993. By 1995, the owners began franchising and expanding across the country. Robert Thomas "Bobby" Reynolds (born July 17, 1982) is an American retired professional tennis player who resides in Marietta, Georgia. Chattahoochee Technical College (commonly Chattahoochee Tech or sometimes CTC or Chatt Tech) is a two-year state technical college with campuses located in the U.S. state of Georgia. It is governed by the Technical College System of Georgia. Chattahoochee Technical College has eight campuses in the north-northwest metro-Atlanta area, and another just outside the region. It is accredited by the Southern Association of Colleges and Schools Commission on Colleges (SACS) to award technical certificates of credit, diplomas, and associate degrees. The college was formed in 2009 as the result of the merger of Appalachian Technical College, Chattahoochee Technical College, and North Metro Technical College. Cobb Place is a 335,190 square foot shopping center at 840 Barrett Parkway Kennesaw, Georgia, in northern Cobb County, Georgia. It opened in 1987, the year after the Town Center at Cobb opened on the other side of Interstate 75. The Cumberland Mall is a shopping mall in the Cumberland district of Metropolitan Atlanta near the suburbs of Smyrna and Vinings. It was the largest shopping mall in Georgia when it opened on August 8, 1973. Home to about 175,890, East Cobb is an unincorporated community in Cobb County, Georgia, United States. It is an affluent northern suburb of Atlanta. The Georgia Gwizzlies is a basketball team that currently plays in the American Basketball Association. They once played in various men's minor leagues: the Continental Basketball League (CBL), the American National Basketball League, and their original stint in the American Basketball Association. The Georgia Gwizzlies moved from Gwinnett County to Macon in Central Georgia, but upon joining the CBL, moved back to the Greater Atlanta area. Home games will be played in Cobb County, Georgia. Gwizzlies players have been invited to tour France and Spain in early fall each year. Embry Malone begins his six-year as GM and head coach and his two older brothers, Alvin and Bennie Malone are co-owners of the pro basketball organization. On 1 June 2010, the Gwizzlies were removed from the CBL for failure to meet league standards by not traveling to games against the Birmingham Sabers and Wilmington Sea Dawgs. Soon afterward, they were reinstated into the ABA. Kennesaw Mountain High School (KMHS) is a public high school located in Kennesaw, Cobb County, Georgia, United States. It was founded in 2000 as a magnet school specializing in science and mathematics, and is one of sixteen high schools in the Cobb County School District. Kennesaw Battlefield Park preserves a Civil War battleground of the Atlanta Campaign, and also contains Kennesaw Mountain. It is located at 905 Kennesaw Mountain Drive, between Marietta and Kennesaw, Georgia. The name "Kennesaw" derives from the Cherokee Indian "Gah-nee-sah" meaning "cemetery" or burial ground. The area was designated as a U.S. historic district on October 15, 1966. Larry Cleo Morris (December 10, 1933 – December 19, 2012) was an American football linebacker. The 1950 graduate of Decatur High School became an All-American at Georgia Tech before enjoying a successful career in the NFL. "The Brahma Bull" was named one of the linebackers on the NFL 1960s All-Decade Team. A Decatur, Georgia native, he is one of the best players the state of Georgia has produced, a standout at the high school, college and pro levels. Little Kennesaw Mountain is a mountain in Cobb County, Georgia, northwest of Marietta and south of Kennesaw. It is a sub-peak of Kennesaw Mountain, the site of the Battle of Kennesaw Mountain in the 1864 Atlanta Campaign of the American Civil War. The defensive-minded Confederate general Joseph E. Johnston constructed a series of trenches from Kennesaw Mountain to Kolb Farm to prevent or delay Union general William T. Sherman's approach towards Atlanta, Georgia. For the purpose of defending the Confederate line, the Confederates constructed Fort McBride here, but Little Kennesaw Mountain experienced only skirmishes, with most of the fighting occurring to the south. Now a part of Kennesaw Mountain National Battlefield Park, the mountain is part of a popular trail that strings from Burnt Hickory Road to the park visitor center, traversing Pigeon Hill and both mountains. Mableton is a census-designated place in Cobb County, Georgia, United States. As of the 2010 census, Mableton had a population of 37,115. When Brookhaven became a city in December 2012, Mableton became the largest unincorporated community in Metro Atlanta. It was named for Robert Mable, who on September 11, 1843, bought 300 acres (approximately 120 hectares or 1.2 km²) of land. The Southern Railway opened a railroad station in Mableton in December 1881, and on June 28, 1882, the post office opened replacing the Bryantville post office about two miles (3.2 km) southeast. On August 19, 1912, Mableton was incorporated as a town but was disincorporated on August 17, 1916. The historic Mable House and plantation, located off U.S. 78 on Floyd Road just north of Clay Road, now includes an amphitheatre which hosts public events.Roy Barnes, governor of Georgia from 1999 to 2003, is from Mableton. Mount Wilkinson is a low mountain immediately north-northwest of and directly overlooking downtown Vinings, in southeast Cobb County, Georgia, USA. Although it rises significantly from the surrounding terrain, it is actually at or slightly below the average elevation for the region, as it is in the Chattahoochee River valley. Formerly called Signal Mountain, today it is commonly known as Vinings Mountain. It is said that in 1864, U.S. Army General William T. Sherman got his first look at the church spires of Atlanta from the summit of Vinings Mountain. The mountain, left only partly forested, is now topped with high-rise office towers, part of the Cumberland/Galleria edge city of metro Atlanta. Among these buildings lies a small, private cemetery in which Hardy Pace (1785–1864), a founder of Vinings and operator of Pace's Ferry, is buried. This is a list of properties and districts in Cobb County, Georgia that are listed on the National Register of Historic Places (NRHP). Pine Mountain is a natural geographical feature located in Cobb County, Georgia, near the town of Kennesaw. Powder Springs is a city in Cobb County, Georgia, United States. The population was 13,940 at the 2010 census, with an estimated population for 2015 of 14,826.In 2015 the city elected its first black mayor, Al Thurman. He was the first African American to be elected as mayor in Cobb County, but was one of several elected in small towns in Georgia in 2015. Town Center at Cobb (often called Town Center Mall), is a regional shopping mall located in Cobb County, Georgia near Atlanta. The mall is anchored by two Macy's locations, JCPenney, Sears, and Belk. Vinings is a census-designated place in Cobb County, Georgia, United States, just across the Chattahoochee River from Atlanta. As of the 2010 census, the CDP had a total population of 9,734. A part of the Vinings, Smyrna, Cumberland (VSC) area, it is located between the affluent West Paces Ferry section of Buckhead in northwest Atlanta, and suburban Smyrna in Cobb County, adjacent to the Cumberland Mall. The U.S. Postal Service assigns both "Atlanta" to the ZIP code (30339) that includes Vinings (area of Cobb County between Interstate 285 and the Chattahoochee River). The Home Depot is headquartered in Vinings. The Whitlock Avenue Historic District in Marietta, Georgia, is an 82-acre (33 ha) historic district that was listed on the National Register of Historic Places in 1989. The listing included 101 contributing buildings.It includes Greek Revival from antebellum times and various styles up to the 1930s. The more important works include the Reid House, at 96 Whitlock Avenue, designed by Neel Reid (1885–1926) and the Maxwell House, at 134 McDonald Street, designed by G.L. Norrman.It includes Italianate architecture from the later 1800s. It includes Late Victorian architecture including Queen Anne.It includes Late 19th and 20th Century Revivals, including Classical Revival and Dutch Colonial.It includes Bungalow/Craftsman architecture.